What is the pivotal reason behind a duvet, dvd, rain outside and no plans and that being amazing? You dont even need anyone else to enjoy it. And its simple. Just like pushing my niece on a swing, and her giggling like its the best thing ever, saying “more”. Simple stuff helps you have a point of reference of realising, what is worth it in this world. Went out with mates last night, and always fanastic to hang out with them and just forget about any worries. Or talk about them and bounce ideas around. Last night was one of those nights. It was also one of those nights where I experenced about 4 different times people saying hi to me at a bar and me not remembering why I know them so begin playing this game show of.. “How does Lloyd know this person?” No game show music though, well outside of my head. But it was a fun game no less. But felt a bit bad it happened 4 times. BUT then I felt heaps better when I said hi to a guy I knew through work and we had a chat etc. Then he came back later and then said “sorry, before I had no idea why I knew you, but have since worked this out”. Which I found awesome, he was playing his version of my game show. Or his game show, it probably has slightly different rules. Also spent all day yesterday on the beach at Manly. I am not really a fan of Northern beaches of Sydney, as they are hard to access and only one real main road that is always crawling with traffic. Who would want to live there? Manly beach isnt even that good. There was a surf rowing event going on there that my company was sponsoring and we also wanted to use it as a backdrop for a shoot. It was the hottest day of summer so far, measuring 46 degrees on the beach. I didnt get burnt.much.more.than.usual. But it was fun, cause the guys I were with are good guys, and the model Matt is a good bloke and heaps helpful and intelligent. 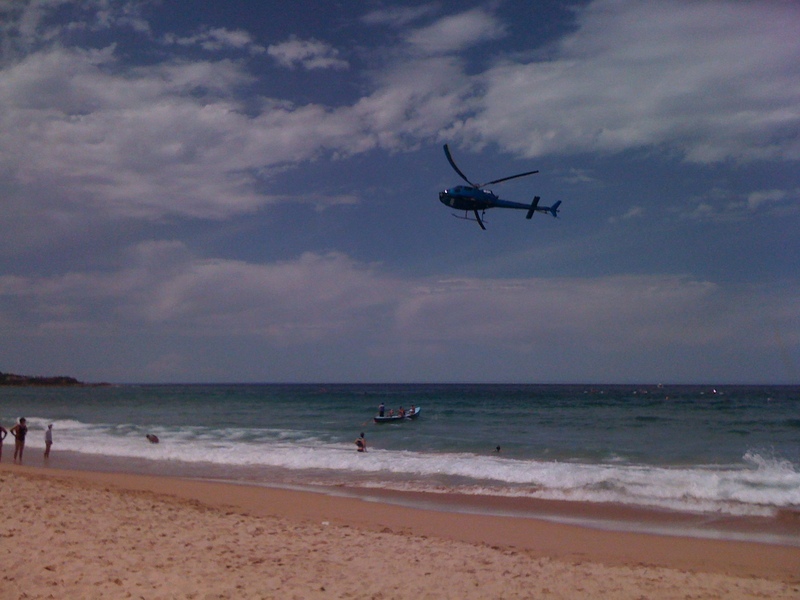 One of the shots was a low flying helicopter coming in from the ocean to the shore, filming Matt standing on the beach. Will be awesome to see the shots. Those kind of days are reasons why my job can be very fun and different. Even though it was a Saturday. Tried to get a Kangaroo burger from a store at the beach yesterday but the sign read “due to heavy rains in northern territory, roos have been unable to be found or shot, therefore we have no meat today”. So I had chicken.